A distinctive relaxing body wash designed to cleanse your body whilst leaving the most sensitive skin smooth and radiant. 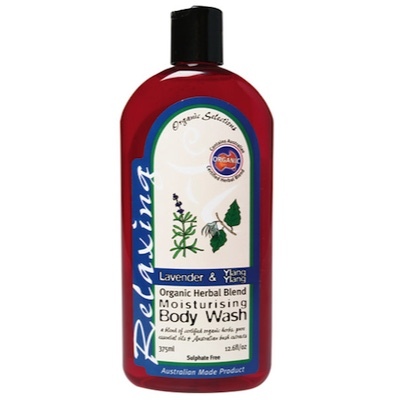 Lavender Oil is gentle, aromatic and is used as a natural perfume to relax the spirit. Apply desired amount to sponge or loofah. Enjoy! Purified Water, Certified Organic Botanical Blend of Lavender, Rosehip, Burdock, Chamomile, Calendula, Horsetail (herb); Organic Safflower Oil, Biodynamic Avocado Oil, Biodynamic Macadamia Oil, Grapefruit Seed Extract, Australian Bush Extracts of Kakadu Plum, Decyl Glycoside (sugar derivative), Aloe Vera, Alpha Olefin, Soy Lecithin, Organic Jojoba Oil, Organic Locust Bean Gum, Guar Gum, Citrus Seed Extract, Olive Leaf Extract, Potassium Sorbate, Sea Salt, Ylang Ylang Essential Oil, Lavender Essential Oil.